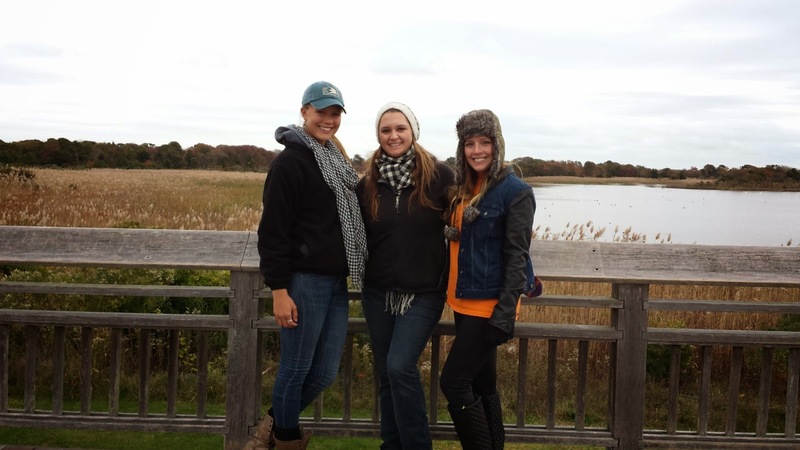 November 30th can mean only one thing in Cape May, the end of another Hawkwatch season. As is traditional in the community of birdwatchers that make Cape May their home, some fun gatherings took place at the platform in the state park today; nothing formal, people just made their own decisions to come down and be a part of the day. With a return to milder weather, it was certainly a pleasant place to be, as a few ducks returned to the thawed out Bunker Pond, an American Bittern scarfed down a poor little short-tailed Shrew, and - of course - there were raptors to be counted. Actually, not an awful lot seemed to be on the move today, but Red-shouldered Hawks put on a fine display as they hunted the marsh edge and the seemingly ever-present Turkey and Black Vultures cruised overhead. Cape May would be nothing without its birding community. With apologies to those who were present on the day but weren't there when the camera came out, but it was good to be present on such a fine, sunny day. 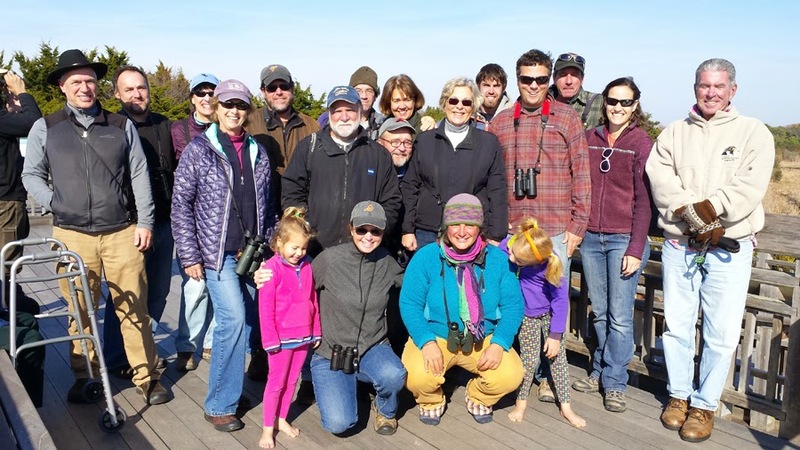 Things can get pretty hectic during the height of migration, but it is during the winter that Cape May birders really come together as a community and have a big old group hug. Massive thanks to Mary Raikes (front row in tan pants) for doing a stellar job this year (and to Swing Counter Tom Reed too [photo by Deb Payson]. The Hawkwatch Platform has an amazing capacity to attract an interesting suite of birds throughout the fall period. This American Tree Sparrow spent Saturday hanging out with the local House Sparrow flock right in front of the platform, though it appeared to prefer native goldenrod seed to anything artificial put down for the birds [photo by Mike Crewe]. American Bitterns have been a regular feature of the Hawkwatch Platform this season, with up to three birds present at any one time. This individual hunted the open, recently cut areas of reedbed in front of the platform at lunchtime today [photo by Mike Crewe]. Birds are truly exceptional, perhaps close to unique - though dog and cat owners might disagree - in the way that they work their way into the hearts and minds of people. Throughout the history of our species, birds seem to have held a variety of roles, ranging simply from food, to essential companionship. Birds, it seems, are important to us and I was fascinated to discover recently another link between birds and people that I was unaware of, but that is very apposite given the pie-filled festival that looms on the horizon - Thanksgiving! The humble Magpie has a checkered history with mankind; most often seen as a symbol of theft and implicated by many (mostly those who don't apply science to their thought process!) 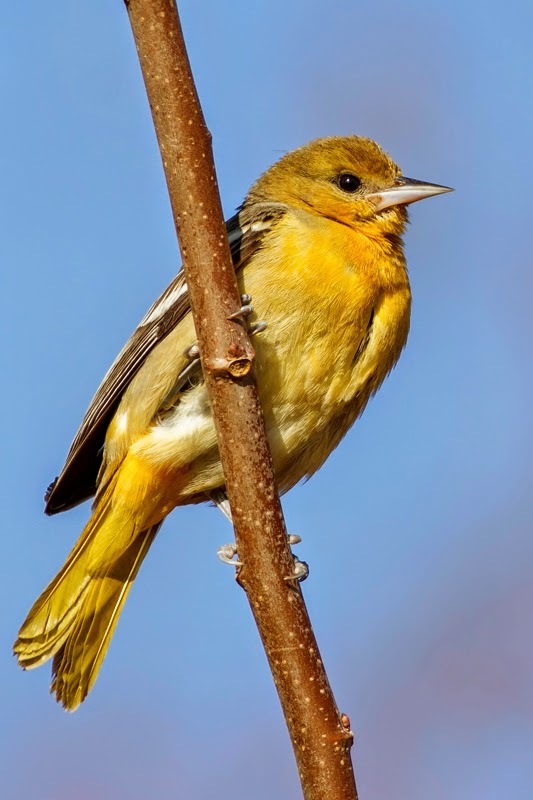 as instrumental in recent downward trends of songbird populations, conversely, they also attract a special reverence, often coming to light in the nursery rhymes of children, and regularly featuring in the writings of great authors such as Shakespeare and Chaucer. Magpies are found throughout the temperate Northern Hemisphere in both the Old World and the New World (modern taxonomy not withstanding) and are obvious to us due to their noisy chattering calls and their striking black and white plumage. We have no magpies in the Eastern USA - for which we should feel hard done by - but they still remain familiar to all, and tales abound that include magpies. So what is this new connection? Well, etymology is a subject that has long fascinated me; that is, the origin of words and how they come about and evolve. It is well-known that the word 'pied' refers to anything that is black and white - thus, the word magpie is said to be a contraction of 'maggot-pie', the pied bird that eats maggots. All well and good, but where does the word 'pie' come from originally - and why is it used for a black and white bird as well as for something that we eat. Well, I was recently reading that the word 'pie' for the thing that we eat actually comes from the pied appearance of the contents of a pie. Not so much black and white, but certainly an assortment of textures and/or colors. Similarly, the often widely varied list of ingredients that go into a pie is said to bear a resemblance to the Magpie's liking for collecting a miscellany of objects to adorn the nest. We may not have Black-billed Magpies in Cape May, but we do have American Oystercatchers. An old name for the oystercatcher was Sea-pie, a name which continues the affinity between a melding together of contrasting colors in birds, and the richness of ingredients in a tasty pie [photo by Mike Crewe]. Global Warming? Don't make me laugh!! As an unseasonably early cold snap sweeps across Cape May and brings a host of avian goodies our way, the nay-sayers are having a field day. Five feet of snow recently dumped itself on the unfortunate residents of Buffalo, NY and the term "Global Warming" comes under attack yet again. Unfortunately this term, which served a purpose when first coined, has given the nay-sayers much opportunity to deny the facts - and that's just what happens if you hang desperately onto a single piece of the jigsaw and ignore all the other pieces. And that's especially a problem when that single piece is, even as I write, tumbling inexorably off the dining room table and heading for the dusty spider web under the book case. Science and understanding is about research, and research is best understood when each project is part of a much broader picture. Global warming over time is happening and is demonstrable; and yes, it has happened before, but right now, it appears to be happening faster than ever before - so we need to understand why that might be. The best way to do that is not to go join the spiders under the book case, but to hang on to pieces of the jigsaw that are firmly on the table. 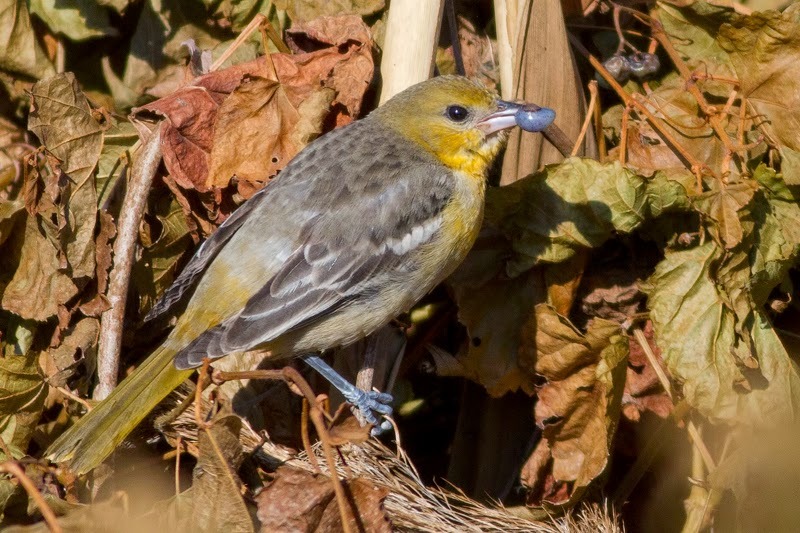 Long-term projects such as the British Trust for Ornithology's Integrated Population Monitoring program don't just look at a single facet of bird life, they take all the pieces and put them together. Though long term, scientific projects such as Constant Effort Sites, Wetland Bird Survey and the Nest Record Scheme are used, much of the work they use comes from citizen science data. The basic bird records and sightings that come from people's daily observations, their notebooks and local survey projects. These can then be tied in and compared with data from other projects; from longer-term, focused surveys with more rigid methodologies to help provide us with the facts - and to help to question all of it, such that we can be as certain as is possible that we have the right answers. And if we don't like the answers, well, ignoring them or denying them does not alter facts. As an interesting example of how an integrated program means that we can gain the facts more effectively, we can scour academia for projects that might not be immediately apparent. A recent paper with the title of Temporal patterns of avian body size reflect linear size responses to broadscale environmental change over the last 50 years was probably discussed at far fewer family breakfast tables than the news story of the Buffalo snowfall, yet it gives us a much better insight into what is really going on. Who would have thought that measurable reductions in bird size were taking place over time on at least three continents around the world? Such reductions in size are consistent with local climate change over time. How do we know? Well, all such academic studies start with data gathering and that can come come from a variety of sources and a significant source of such data is the daily recording and logging of your local birds. Let's all be a part of this - it is truly fabulous that we can go out and enjoy our birds, record what we see and leave academia to do the boring backroom stuff. Enjoy your birds, but record and report what you see - be a part of making a difference! 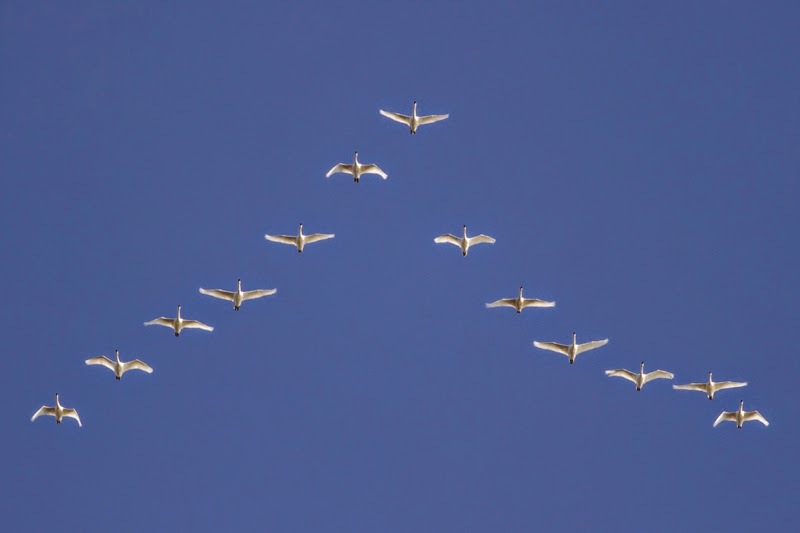 High on the list of indications that cold weather was heading our way was the recent run of Tundra Swan sightings. These impressive Arctic visitors seldom spend the winter with us, but pass through on migration and can be a highlight of any cold day in late fall or early winter here. An exceptional (in recent years at least) count of over 70 birds was on Bunker Pond on November 20th, while the birds in this picture were passing over the Avalon Seawatch. Where are they going and where did they come from? Answering such questions will give us an insight into the lives of these birds, while recording over time will show if population numbers change, or choose different migration routes and wintering grounds [photo by Sam Galick]. 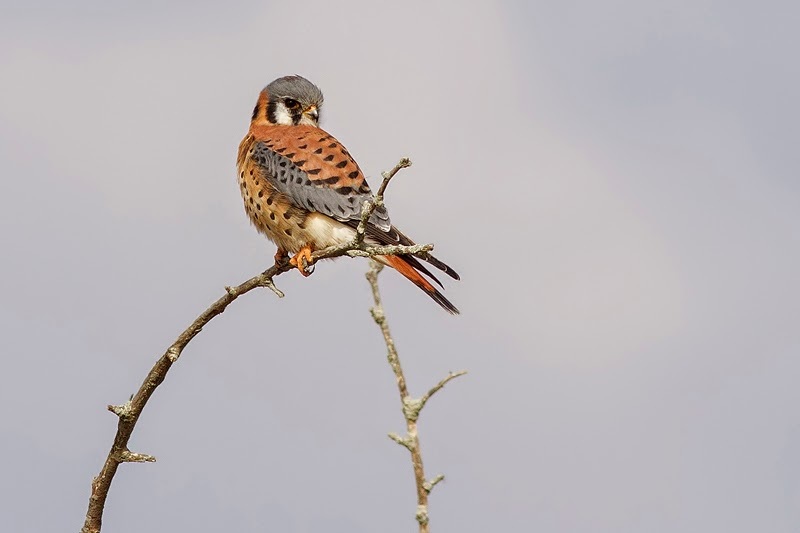 In the summer, American Kestrels feed largely on sizable insects such as crickets and grasshoppers, so how do small numbers of kestrels manage to survive the winter here, when such prey items are not available? Studies have shown that they switch to feeding more on small birds and rodents - but will this change if the climate changes? Can careful monitoring of winter distributions of kestrels and recording of prey items offer inferences about climate change? If we don't do the work, we won't know [photo by Sam Galick]. Although this Loggerhead Shrike has been present at Corbin City Impoundments since at least October 8th, it's taken time for it to come close enough to the trail such that good photos can be achieved. At a distance, Loggerhead and Northern Shrike can be hard to differentiate and this bird bounced back and forth for a while. 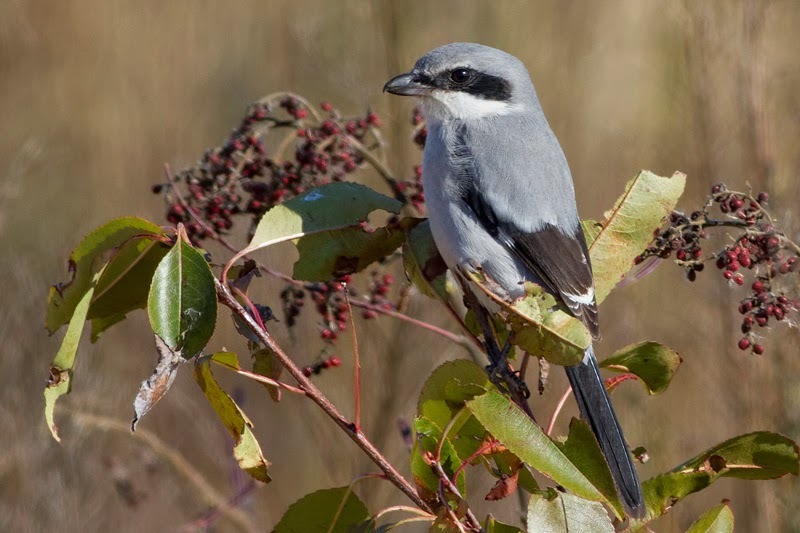 At close quarters, the lack of visible scaling on the underparts, lack of white supercilium and relatively short primary projection all support the identification as Loggerhead Shrike. Much of our knowledge of the separation of these two species visually has come from scientific collections held in a number of museums and scientific faculties around the world (not to mention the science required to build the camera that took the picture!) [photo by Sam Galick]. 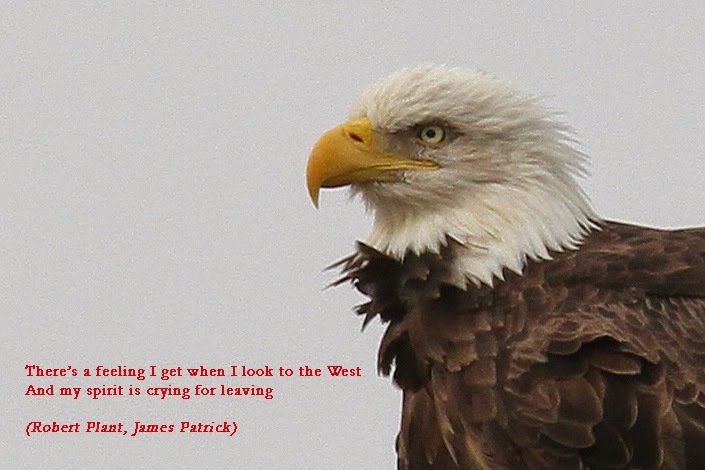 Bald Eagle at Cape May Point State Park [photo by Mike Crewe]. As I sit in my office, with the hammer, hammer, hammer sound of another batch of new houses being squeezed into Cape May Point, it seems like a really good time to reflect on where we are and what we are doing. During the wonderful migration that takes places through Cape May in fall (and still continues offshore at the Avalon Seawatch), there is little time to look at our surroundings; we are awash with birds, everyone is having a fabulous time and all is great with the world. But as the door of the Northwood Center starts to stay closed just a little longer, the sun sinks below the horizon beyond Lake Lily and the Spring Peepers realize it really is time to go to sleep now, it leaves at least a little time to actually think ahead and ponder the plight of our migratory birds. A common misconception for many people is that birds flock to Cape May because it has fabulous habitat for them - and that's why they come. Cape May does indeed have some important pieces of habitat, but is there enough? And are these patches in the right place? Migratory birds come to Cape May largely as a chance result of geography and weather patterns. 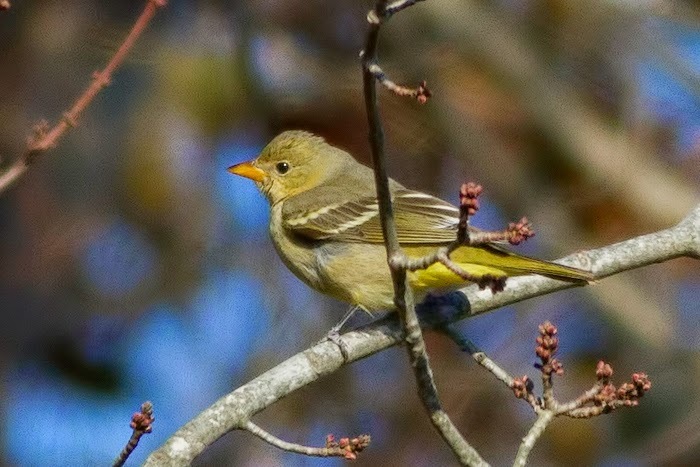 Prevailing north-west winds in the fall, coupled with the funnelling effect of the Atlantic Coast and Delaware Bay, concentrate unnaturally large numbers of birds at Cape May. Unnaturally large? Well, yes, because, given the choice, these birds would not choose to all end up in a big heap on when small spit of land. So, it does seem as though we therefore need to provide an unnaturally large amount of space for them - if we consider it our place to care about them that is... This means that these migrants need to find food and shelter when they arrive at Cape May. They need woodlots, field edges and a good supply of insects and berries. Every day throughout the entire year, one can drive around the area and see habitat disappearing; the parkway is being 'improved' to allow even more traffic to have ready and easy access to the area; arguments rage in every coastal community about just how much land do these birds really need to nest on - and what harm does all that beach raking do anyway? Now that the crowds have gone, these Black Skimmers can rest on the beach at Ocean City. Along with a number of other species, long-term observations are showing that Black Skimmers are staying ever later into the end of the year in New Jersey - but what does this mean? Is it a response to climate change? Are they changing their behavior because their food items are changing theirs? Long-term data collection using robust protocols is surely the best way to find out [photo by Viv Buckley]. Occurrences of rarities are always fun, and the best way to guarantee getting a birder out of a stuffy office!! 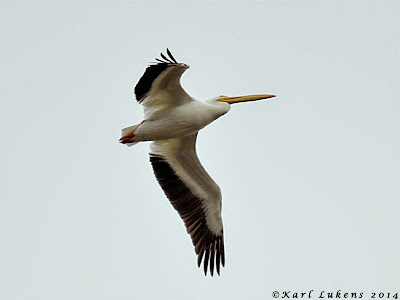 Recording the occurrence of a rare or uncommon bird - such as this American White Pelican over Cape May Point last Sunday - may seem frivolous, but accurate identification, recording and monitoring of such birds can give us a valuable early insight into potential changes in bird behavior. Since birds move more readily and generally over far greater distances than most other forms of life, they are great indicators in not only the health of our planet, but also in possible changes that might be occurring in either weather trends or macro-ecosystems [photo by Karl Lukens]. 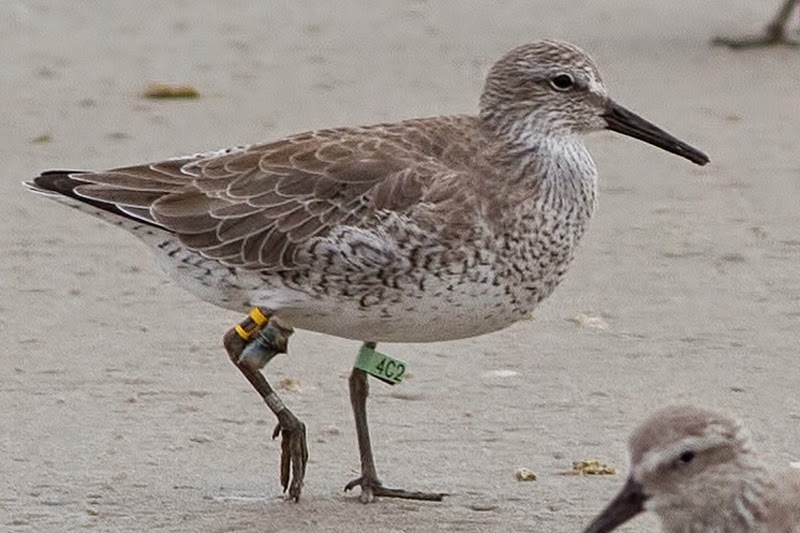 ...In recent years, technology has allowed geolocators to be miniaturized and fitted to the legs of Red Knot (note the yellow leg band and lump of data collector on the bent leg). These pieces of kit record data based on day length and timing of sunrise and sunset, allowing us to calculate where the bird is. The vast majority of bird banding, and other schemes, rely heavily on other people to be observant, notice the birds, and send in their findings. 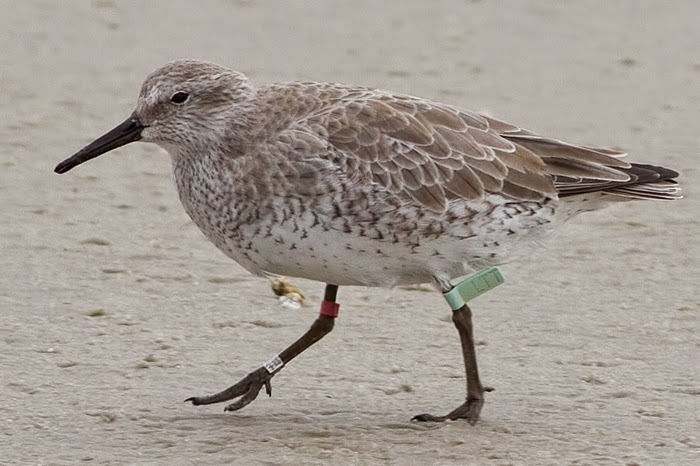 If see a marked bird, record as much as you can about location, habitat, time, date and other associated birds, and send your findings to the Bird Banding Lab. The best way to do this is through their website which you can reach by clicking here. 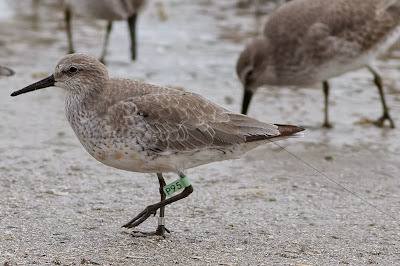 For any banded shorebird here in New Jersey, you may also visit the DuPont sponsored, Delaware Estuary Initiative site. As news reaches me of a Black-headed Gull in Cumberland County, I am reminded that this coming Sunday we will be running our 'Bayshore Birding at its Best' visit to the very best birding locations in that very same county. Though it is tough for pretty much anywhere on the east coast to compete with Cape May when it comes to migration, the upper reaches of the Delaware Bay really start to come into their own once November arrives and the winter birds start to flood in. Weather patterns over the past few weeks have produced relatively mild weather for the time of year, but the first early morning frosts are starting to provide Cumberland County with a great range of early winter birds. Cumberland County offers some spectacular wide landscapes, with vast, sweeping views across the expansive saltmarshes of the Delaware Bay. Snow Geese will soon be flocking there in great number and, already, numbers of wintering Bald Eagles and Northern Harriers are building up. Nearby, a rolling landscape made up of a patchwork of farm fields and wood lots ensures there is always plenty of birds to be found; a wide diversity of sparrows, juncos, towhees and other seedeaters feed quietly in the leaf litter along the woodland edges, Wild Turkeys gather in droves to feed on spilt corn, and great black clouds of blackbirds and grackles flow across the landscape. Cumberland also has a great number of working and abandoned sand pits, offering a good number of places to seek out a wide range of ducks and other waterfowl. A number of the pits are relatively deep and well stocked with fish, which makes it a great place to look for a number of diving duck species, as well as the usual dabblers. This is a fabulous time of year to be out and about in Cumberland County, and there is no better way to explore this area than with CMBO volunteer naturalists and keen Cumberland fans, Karen Johnson and Janet Crawford - a good time will be had by all!! To book one of the last places or find out more about this pre-registered walk, contact our program registrar on 609-861-0700. See you there! 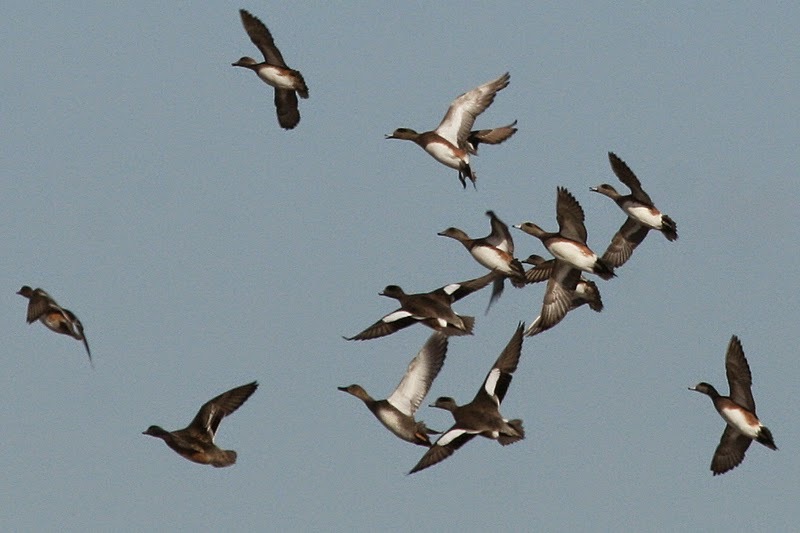 Great flocks of dabbling ducks - such as these American Wigeon - add a kaleidoscope of color to Cumberland's ponds and creeks [photo by Mike Crewe]. 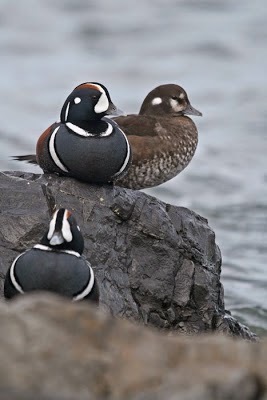 Busy parties of Buffleheads are now arriving at coastal waterways and Cumberland County offers some great opportunities to enjoy these smart ducks [photo by Mike Crewe]. Our November trips are always full of a great diversity of sparrows and we offer plenty of opportunity to get to grips with these birds. High on the list of priorities will be seeking out the wonderfully skunk-headed White-crowned Sparrow [photo by Mike Crewe]. Northern Harriers find plenty of good hunting in the open fields and marshes of Cumberland County and the sight of a 'Gray Ghost' slipping silently down the edge of a meadow as a watery sun gives the tawny grasses a golden glow is truly the essence of a November day's birding along the Delaware Bay [photo by Mike Crewe]. 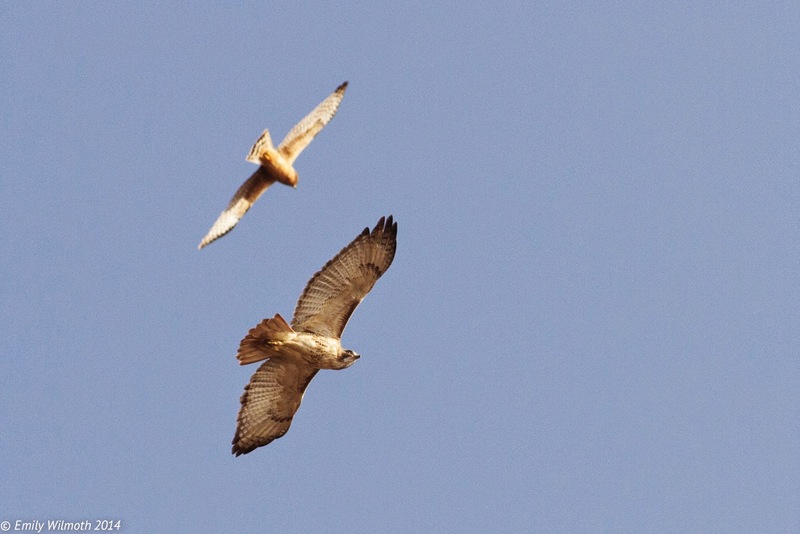 A Northern Harrier and Red-tailed Hawk circle over the Hawkwatch platform. Throughout September and October, a whopping 231 species of birds were spotted from the Hawkwatch platform. This list includes Whiskered Tern, Common Raven, and Zone-tailed Hawk as some highlights. It is incredible how much diversity can be seen from a single location in as little time as just two months. Mary will continue counting hawks through November, so there is still time to add even more species to the season Hawkwatch list. This past week in Cape May was just as exciting as any. 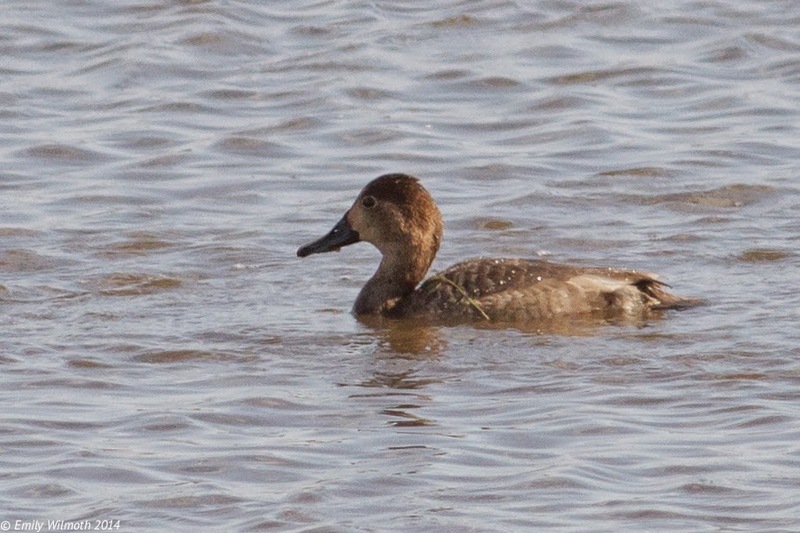 A variety of ducks continued to show up on Bunker pond, including the first Redhead and Bufflehead of the season. 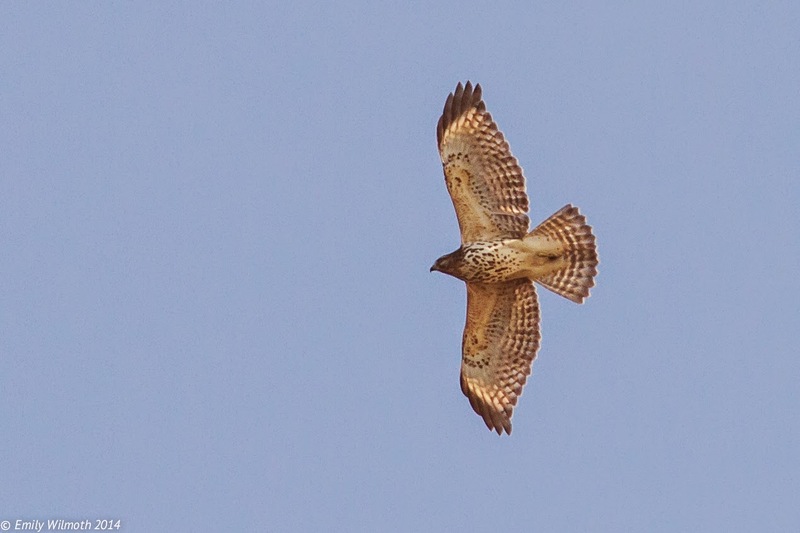 Thursday was the highest hawk count of the fall so far, with 2,003 hawks (including a Rough-legged Hawk). A Great Horned Owl perched in a tree at the State Park that evening added a special ending to an outstanding day. One of the 68 Red-shouldered Hawks counted on Thursday, October 30. With so much excitement going on, it is really difficult to say goodbye. However, I am certain that this is not the last you will see of your 2014 seasonal naturalists. We all love Cape May and will definitely be back to visit in the future. So, we will just say see you later!